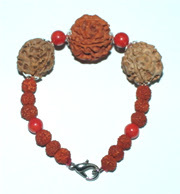 Horoscopic Sign :- AriesPlanets :-Mars This bracelet thus designed with two beads of three face and one bead of five face nepali rudraksha along with coral stone to strengthen and improve the ruling planets.Strung in thread with silver accessories.Good for strength, Valor, Energy and Vitality. Those who have been defeated by enemies, are hopeless about their future, are struggling in life should wear this bracelet. 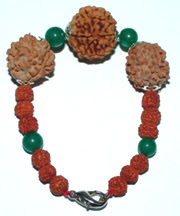 Horoscopic Sign :- TaurusPlanets :-VenusBracelet made with one six mukhi,one four mukhiand one seven mukhi with spatic crystal beads along with silver spacers.Good for mental activities. Good for accountants, Business Managers, Orators and those involved in research work. Saves a person from troubles, increases power of faculty, gives mental peace, pacifies the anger. 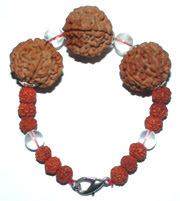 Horoscopic Sign :- GeminiPlanets :-Mercury Combination of rudraksha;-2 beads of four mukhi and one beads of six mukhi strung with emrald stone with silver accesorries.It allows a person to think, discriminate, express oneself and to move about. This has been called an animator of movement and is associated with nervous system: to improve the communication . Horoscopic Sign :-LibraPlanets :- venus It is designed with two seven mukhi and one six mukhi rudraksha bead and spatic crystal beads.Strung in streachable thread with silver accessories. Removes physical weakness and mental worries.